Al Arabiya TV has reported that Colonel Gaddafi's son, Saif al-Islam, has been killed on the same day as his father. In the meantime, a Libyan minister says Gaddafi’s heir apparent is wounded and in hospital. According to Al Arabiya, his corpse has already been brought to Misrata airport. Saif al-Islam, 39, the second son of Muammar Gaddafi, was his chief confidante and carried out public relations and diplomatic roles for his father. He was a very public figure and one of the most recognizable Libyan officials in the West. 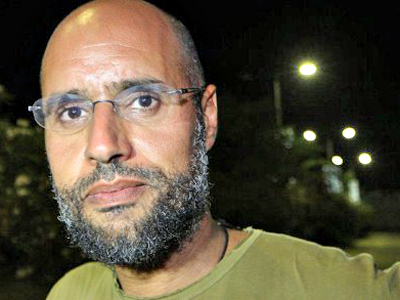 Before the uprising swept Libya, Western nations viewed the well-educated Saif al-Islam as his father's heir apparent and a possible reformer. In 2008, he received a PhD degree from the London School of Economics. In June the International Criminal Court charged Gaddafi and Saif al-Islam with crimes against humanity for the torture and killing of civilians and ordered an arrest warrant.